The Toraja ethnic group of South Sulawesi has some of the most elaborate death customs in the world, and the Londa burial caves, the region’s oldest, provide the best opportunity to encounter these fascinating traditions up close. After an expensive, intricate funeral – held months or even years after death – the deceased’s coffin is either laid in a stone cavern or hung on a cliff face. 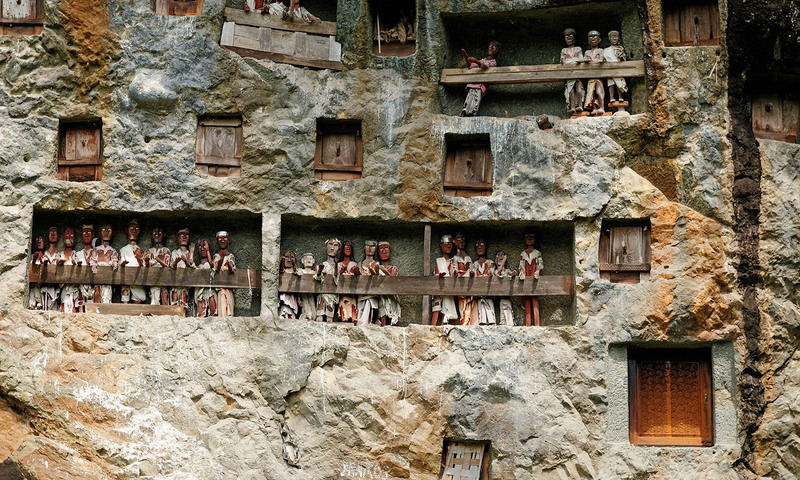 Upon approaching the caves, visitors can observe the hanging coffins and tau tau (carved wooden effigies of the dead) tucked into crevices in the cliffs. At the entrance, be sure to buy a lantern since there's no lighting inside, and negotiate with a tour guide for the best deal. Inside, the cavern extends for hundreds of metres, and the low ceilings can make it difficult to navigate. Watch your step – there may be a centuries-old skeleton underfoot. The Londa Burial Caves are located in TanaToraja in South Sulawesi. Visitors can travel to the caves on international flights from Singapore and Kuala Lumpur to Sultan Hasanuddin International Airport in Makassar (there is also a number of airlines that fly domestically to Massakar from Jakarta and Bali). Visitors can then choose to make the rest of the journey by plane to Pong Tiku Airport in Rantetayo (about one hour) or take a bus (about eight to 10 hours). Guided tours cost about US$2.50.